The Lifestyles Team in the Health Improvement Service of Bromley Healthcare, which is made up of just two people, was tasked with providing the Walking Away from Diabetes (WAFD) programme for 320 people identified with pre-diabetes in the London Borough of Bromley. In order to promote the programme they launched an event which allowed the referral networks to be set up. There were 1,242 referrals received from April 2014 to October 2015 from 98 per cent of all GP practices in the area. Since then, 630 of those people have completed the programme and another 221 are booked onto further sessions until March 2016.
iends. The team have gone above and beyond to further demonstrate the impact clinical outcomes people, who completed the programme, are experiencing. Marryllyn became part of the WellSouth team in 2014 and has been proactive in bringing DESMOND to the Southern Region of New Zealand, which is the only centre to offer the programme in the country at the moment. 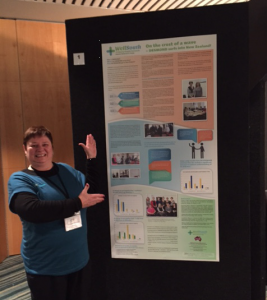 She was involved in writing an article for the Diabetes NZ magazine about DESMOND and also presented at the Diabetes NZ Conference in October. Marryllyn’s colleagues say she brings a bubbly, friendly attitude to the team and takes feedback seriously as she is always looking to see where she could improve her delivery. She has demonstrated a commitment to completing the DESMOND quality development process by being proactive in booking her first mentoring session with the Australian team. She is committed to providing the best possible care pathway for patients, so will follow up with them individually if she has any concerns about the management of their diabetes. The core delivery team of accredited Educators all bring their own unique understanding and personality to the programme, enriching the experience of participants. The team is always willing to go the extra mile to support each other and all their participants. In addition to their work remit, team members are committed to developing innovative ways of working to enhance the service. 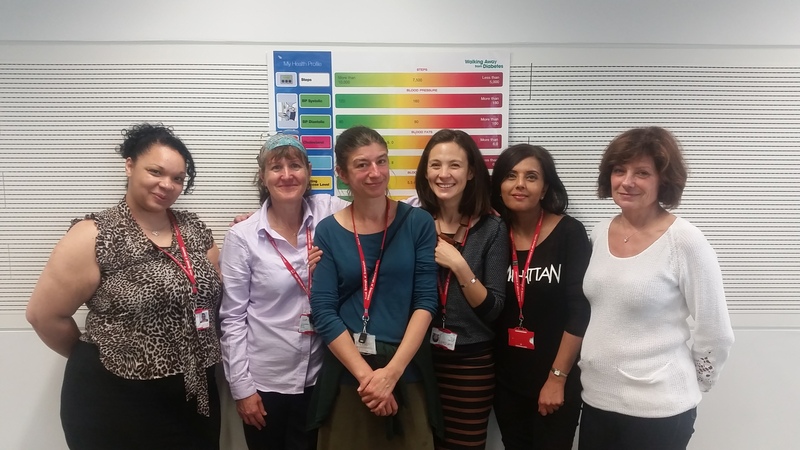 They are currently working with the Learning Disability team at Royal Greenwich to deliver an adapted programme which will help to support frontline staff working with adults with learning disabilities. The team run over 40 sessions a year with an average of more than eight people attending per session. They are committed to addressing health inequalities and continue to meet all key performance indicators in relation to ethnicity and social deprivation. A forward thinking integrated diabetes team which delivers specialist diabetes care in the community. The team seamlessly integrate with primary care and facilitate the transfer of bidirectional patient flow between primary and secondary care. The team, which is made up of 11 DESMOND Educators, has an estimated 25,000 patients in Brent. Following an audit last year, they discovered that the invitation to appointment rate was just under 50% with a high non-attendance rate crossing 31%. This affected their efficiency so they put in processes to improve services. A year later and they have seen an improvement in all areas including number of referrals, invitation to appointment conversions and total number of attendees. The Leicester Diabetes Centre offer courses in many different areas which ensures attending a DESMOND course is accessible for the patients. The team receive over 400 referrals each month and deliver up to 22 courses per month, which include DESMOND BME courses, Walking Away from Diabetes and A Safer Ramadan. They have worked hard to achieve a reputation in dealing efficiently with patients as their priority is patient wellbeing. As a team they support each other to ensure consistency in their delivery of service, which enables them to discuss with each other ideas on how to improve process and practices within the office. They have introduced a bespoke DESMOND database, which has helped make it easier to process patient data and retrieve information vital to commissions. Their friendly working environment ensures they function effectively and meet their commitments. The team say they are “proud” of how they run the DESMOND service to such a large amount of people. Since attending a DESMOND Programme in July this year, Grant has lost 10 kilograms as well as halving his blood sugar level. He no longer requires statins and his medication is now less than his originally prescribed dose. Prior to diagnosis Grant felt fatigued, but since attending a DESMOND Programme people have started to notice the difference. DESMOND gave Grant tools to turn his life around, and the hardworking team at the Craylands Clinic, Basildon helped to keep him engaged with the programme and provided him with necessary information.